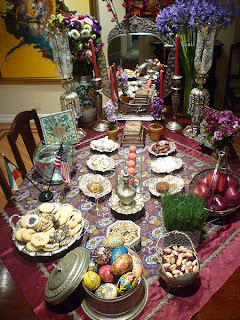 Norooz, the Persian New Year is celebrated by millions of Iranians around the world. Not only does Norooz mark the first day of Spring, it also marks the beginning of the Iranian calendar. This year Norooz begins on Wednesday, March 20th, however; there are festivities around the world that start before, as well as, after. Sale no mobarak! Los Angeles is nicknamed Tehrangeles, as it is home to almost one million Iranian residents which all celebrate the Persian new year. Every year items are placed on a table to symbolize things (a mirror represents sky, as a candle represents fire, a goldfish represents animals, as painted eggs represent humans, etc.) that we are truly grateful for. Although many Iranians love to celebrate with their families, there are also many who love to attend events for the New Year. For instance; on March 15th, The Midnight Mission will be hosting it's 2nd annual Norooz Festival. Located on 601 S. San Pedro St, this event starts at 3 pm until 6 pm which consists of a street fair. For more information, please call (213) 624-9258. Vaghte asr on March 16th , you can attend the Norooz festival at the Arena for just $10 per ticket. Located on 6655 Santa Monica Blvd, the festival this year is 5 hours long and includes a lot of non stop entertainment such as music by the Black Cats, Traditional Persian Dances, Face & Egg Painting, Norooz sing-a-long with kids, the Djanbazian Dance Academy, Kiddie Karoo Musical Puppet Show, and much more. Chaaykhaaneh wine, champagne, and beer tasting is also an event you do not want to miss. Make sure you bring your ID at the door. For more information, please call (310) 383-2110 or (818) 288-4050. Oghateh khoobi dashteh bashi azizam. On March 17th, the Los Angeles County Museum of Art (LACMA) is holding it's 5th annual Norooz celebration. Located on 5905 Wilshire Blvd, the action starts at 11:30 am and goes on until 7 pm. This Norooz celebration is sponored by Art of the Middle East and the Farhang Foundation. Although the event is free, general admission to the Bing theater is $15. For more information, please call (323) 857-6000. The children are our present as the children are our future. On March 17th, from 11 am until 6 pm the Child Foundation is hosting it's 12th annual Norooz celebration. Held at the Hilton Irvine at the OC airport on 18800 MacArthur Blvd, you will not want to miss out. With everything from face painting and delicious Persian food to Haji Firooz and Haft seen, you are going to want to attend. Plus, the admission is free. For more information, please call (949) 754-0611 or (310) 453-0809. Vaghte asr on March 19th, the official 4Shanbeh Soori After Party will be held at Landmark in Corona Del Mar. Starting at 9 pm until 2 am, this special Norooz event is organized by Pure Production. Meet new friends or bring new ones to enjoy the experience. Must be 21+. For more information, please call (949) 675-5556. Norooz is such an exciting time for Iranians around the world. On March 20th, Serra's Dine and Dance is hosting a night to remember. Starting at 9 pm, not only will enjoy amazing music, but great drinks and Persian food specials. Located in the heart of Studio City on 12449 Ventura Blvd, if you are looking for a night to remember this is the one. Must be 21+. For more information, please call (818) 760-1002. Man in ghaza ro doust daram. On March 21st, you can celebrate Norooz at the Le Foyer Ballroom & Lounge. Located on 6730 Laurel Canyon Blvd, not only will this event offer a full 4 course meal, but also offer 20 different appetizers, fresh fruit, and a dessert station. An array of beverages which include soft drinks, coffee, and Persian tea is also available. Ghazato bokhor! Tickets are just $70 per person/$25 per child. For more information, please call (818) 634-8873. Triple D is always a great time. You know dining, dancing, and drinking. On March 21st, Shabeh Jomeh is holding an amazing Norooz event which consists of dancing, dining, and drinking. The fun will be held at STIR Restaurant & Lounge located on 13359 Ventura Blvd in Studio City where it will begin at 9 pm and there is no cover (which is $10) until 10:30. Must be 21+. For more information, please call (818) 986-2000. Vaghte asr on March 21st, the Iranian American Lawyers Association is holding it's annual Norooz mixer at the Cucina Bene, which is located on 4511 Sepulveda Blvd. The cost is $50 per person which also includes dinner. Sponored by the Iranian Hotline. Must be 21+. For more information, please call (310) 266-5354. Ba man bia. On March 21st, the Iranian Psychological Association of America is inviting you to their annual IPAA Norooz Gala. Starting at 7 pm on 11301 Olympic Blvd in Los Angeles, you will get to indulge in the finest hors d'oeuvres, dinner, and dessert. This is a classy event and costs $95 per seat or $900 for a table of 10. Must be 21+. For more information, please call (310) 499-5622. Norooz should always be fun. On March 23rd, LURE Nighclub is holding it's annual Norooz celebration. The fun starts at 10 pm and goes until 3 am. LA and OC's hottest DJs will be spinning all night. Located on 1439 Ivar Ave in the heart of Tehrangeles, you will not want to miss this party. Limited bottle specials and VIPs available. Must be 21+. For more information, please call (323) 463-0004. Embracing the Persian culture is one thing, but learning about refined history is another. On March 25th, the California State University in Long Beach is hosting a free screening of "Iran, the Forgotten Glory" which is organized by the MAKAN Foundation. This is a documentary film by an Iranian director and writer. It starts at 6 pm. For more information, please call (562) 985-4111. On March 26th, the Irvine City Hall invites you to a beautiful Norooz reception. Located at the Civic Center Plaza, the Eid dee dani starts at 4 pm and lasts until 5 pm which includes various refreshments such as pastries, tea, and fruit. After 5 pm the city council will hold a meeting followed by a reading of the proclamation. For more information, please call (949) 724-6000. Always for a great new year and always for an even greater cause. On March 29th, the IMA foundation is hosting it's Norooz celebration at 3376 Motor Ave in the heart of Los Angeles. Dinner and entertainment is held by POUYA. For more information, please call (310) 202-8181. The traditional dinner consists of Sabzi Polo, Reshteh Polo, Dolme Barg, and Kookoo Sabzi along with doogh and/or Persian tea. Although it is a wonderful experience enjoying authentic Persian cuisine in a home with family, there are several amazing Persian eateries in Los Angeles have their doors open for this particular event. Some of these restaurants include: Shaherzad, Darya, Aram, Reyhan, Baran, Raffi's, Persepolis, Shamshiri, Farid, Pasha's, Javan, Kolah Farangi, Sultani, Le Maison de Creme, Shiraz, Dlish, Peris, Heidar Baba, Arthur's Garden, Flame Persian, Cafe Glace, Dowtown Kabob, Ruby Room, Kings Kabab, Sangak, Nersess, Massis Kabob, Royal Vanak, Jino's Pars, Kabab & More, Shah-Abbas, California Kabob Kitchen, Shirazi, and more. In besiar khoshmazeh ast!